Unfortunately, good grammar simply doesn’t reflect the way people speak. That’s a real problem – even for good copywriters – who need to stimulate a primal urge to buy in the reader. Writing copy that grabs the reader’s attention and compels them to keep reading is an art. 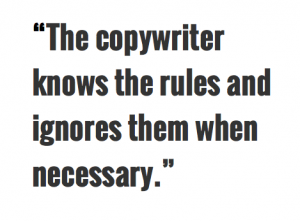 And like all artists, the copywriter knows the rules and ignores them when necessary. Here’s the Copywriter UK guide to the grammar rules you should be ready to break. Contractions are the essence of informal speech. We use them all the time in conversation. While it’s true that they may not be correct for formal writing, they can and absolutely should be used in most B2C sales and marketing copy. Customers do not want to be talked down to. Or rather they don’t want to be talked down to. Starting a complete sentence with a conjunction like ‘and’, ‘or’ or ‘but’ is a useful way to draw attention to it. Or to remind the reader of a separate benefit. (See what I did there…?) Another reason sentences starting with conjunctions are so popular with copywriters is that they’re a useful way to break up overly long sentences. Most readers skim rather than read these days, especially online. We need to have a way to make long or complicated arguments without losing them. These are something print journalists have always relied on, especially in narrow columns. Often they’re the only way to break up large blocks of text. Besides, paragraphs should be used to make a single point or argument. Sometimes, one sentence is all that’s needed to do that, particularly if it’s a long one. They’re also a useful way to transition between sections, make a point, or give the reader a mental rest. Copywriters have to be very careful when using slang. Get it even slightly wrong and your copy will fall completely flat. However, using slang or jargon can be very useful if you’re writing for a niche audience that you know well. It establishes the writer as an expert, or as being part of the right ‘tribe’ e.g. blogging for sci-fi fans. The trouble with never using an adverb before the verb is that it puts the emphasis on the verb. Sometimes what you want the reader to notice is the way someone did something rather than what they actually did. So with the now infamous ‘to boldly go…’ The point is not that the crew of the Enterprise went where no man had gone before. The point is that they did it ‘boldly’. And by putting the adverb ‘boldly’ before the verb ‘go’ that’s just the message the audience gets. This is a particularly important tool for copywriters, where they may be trying to generate new emotional connotations with mundane actions associated with the product we’re selling. Breaking this rule may surprise you as all copywriters are told that the active voice is best. However, there are times when the passive voice is very useful. Using an active voice produces attractive, crisp, dynamic copy, but it’s only one tool in the smart copywriter’s tool-kit. The passive voice is just as useful if you know when and where to employ it. They put the recipient or receiver of an action first, and the performer of the action second. Passive voice can be used when you are trying to sound objective, when you are putting the benefit first, to enhance SEO and to slow the reader down so they actually read your copy. By now you should be breaking the rules of grammar with confidence. But if not, our expert team of copywriters know just how to craft copy that speaks to your target audience. Give Copywriter UK a call today on 0845 2606 255.